My kids love to read and hate to read at the same time. It’s kind of odd, really. They love when I read to them and when they are engrossed in a book. But sometimes they just don’t want to read. I typically lay off because they will not learn to love reading by me forcing them. But I do try to find ways to get them excited about reading. 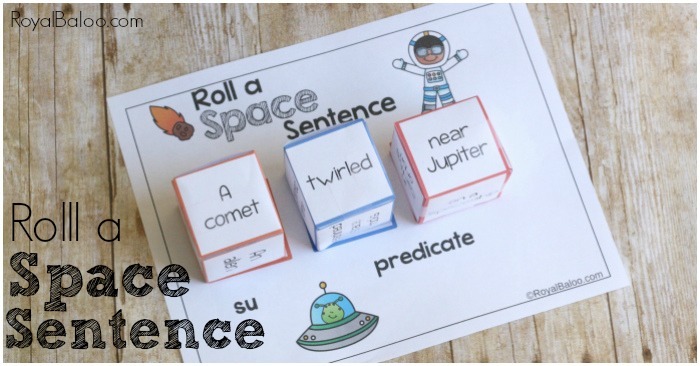 Silly sentences have done that for us. 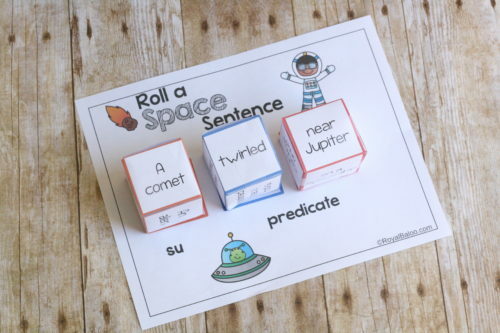 And I think the Roll a Space Sentence printable will also be a hit. 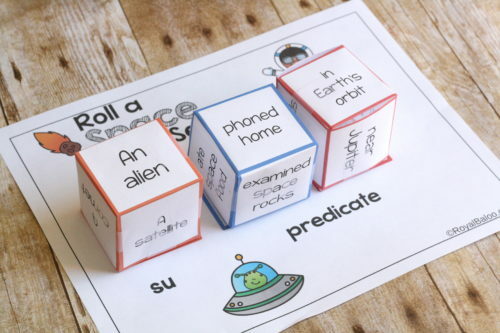 It’s time for another super fun week full of printables on one theme – and this time it’s SPACE. 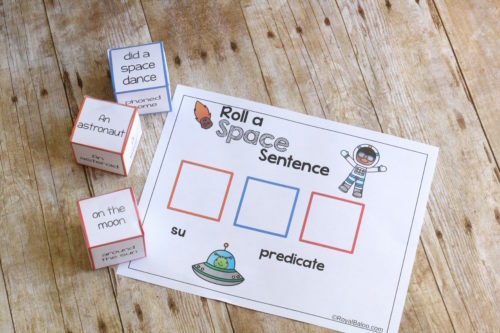 Yes, a full and amazing week of Space printables. Shoot me an e-mail (erin at royalbaloo.com) if you have a specific request and I will do my best to get it done. 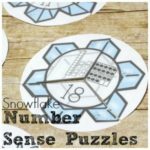 Otherwise – make sure you’re on the newsletter list so you will receive the counting and addition mats in the Space newsletter! 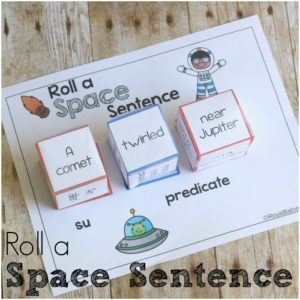 These Roll a Sentence printables have become such a hit around here. My kids are actually requesting more of them. They never ask me for printables. Baloo even helped me pick some of the phrases for this one! I always print these on regular paper because we tend to use them for just a day or two. As long as they aren’t going wild with the dice, they will stand up to play for a few days. It is entirely possible to make the dice with cardstock though and they will withstand more use. I’ve also included a larger set to be used with these large photo pocket dice. 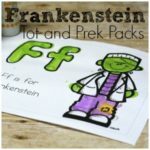 They are a bit simpler to make and will take a lot more abuse from the kids. Cut out on the outer lines. Just roll and go, really! Roll each dice in turn (or all at once for a bit more excitement). 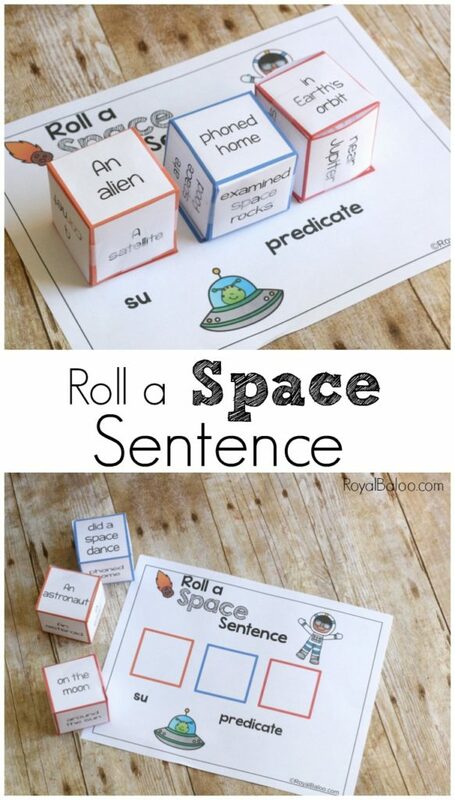 Match the dice by color with the squares on the sheet and you should have a sentence. Hopefully a silly sentence. This was one of my favorites. I’m not entirely sure my kids understood the E.T. reference.